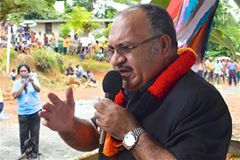 Papua New Guinea Prime Minister Peter O’Neill, has reassured the mining sector that the Government is not considering change introducing a new Mining Act in this term of Parliament. Speaking at the 14th Mining and Petroleum Conference in Sydney this morning, the Prime Minister said any changes to the legislation in support of the resources sector must be introduced carefully and with full consultation with all stakeholders. “Our aim is to achieve a fair deal for our people, both landowners directly impacted, and also the country as a whole, and this has been the driving force behind the proposed changes. “I know that many have worked tirelessly to develop the draft Act, both from Government and from industry. “I thank you for engaging with each other so honestly and openly. “I want to state categorically that there will be no changes to the Mining Act prior to the 2017 National Election. “It is only right that the new Parliament be granted the mandate to carry forward any changes to the existing Mining legislation. “Again, I stress that industry will be fully consulted. The Prime Minister said the Government’s recent decision to give 33% of direct shares in the Ok Tedi mine to landowners and the provincial government, and the 17.4% of BCL shares to landowners, is a clear indicator of our desire to share benefits through this policy. Speaking at the conference, PM O’Neill, also made the point that though there has a downfall in the commodity prices, the economic fundamental is still very strong and it is a good time to invest in Papua New Guinea. “2016 has certainly been a challenging year and there is no doubt that 2017 will similar for the global economy,” the Prime Minister said. “But, I am confident we have established the foundation, substance and and capacity to continue to weather this storm. “We have navigated a safe path through these troubled times for a number of years now, and we will continue to move forward with determination.